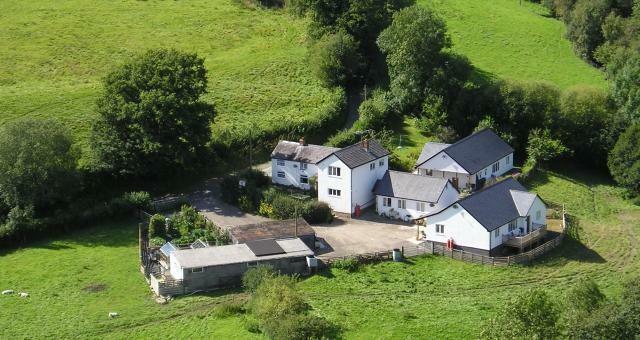 Madog's Wells01938 810 446work Self-cateringMadog's Wells is situated in eight acres of beautiful countryside with woodland walks all around, plenty of wildlife and is ideal for bird-watching, walking or touring Mid Wales. You can watch the birds from your breakfast table. Swallow Cottage - Sleeps 6. 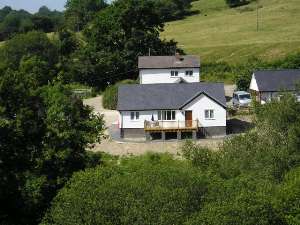 All three cottages are wheelchair friendly and an access statement is available. All our self-catering units contain ample cooking utensils, china, cutlery, Free-Sat TV, smoke detectors, fire extinguishers and first aid kits. All heating, bedding, linen, some towels, tea towels and utilities are included in the prices. There is ample parking and patio tables and chairs are outside each unit. A rotary clothes line, pegs and washing machines are available for guests use. We have a travel cot and high chair available on request. Lots of equipment for disabled guests, access statement available on request. Hoist - £20 pw. This is payable on arrival and is towards servicing costs. A458 from Welshpool or Machynlleth into Llanfair Caereinion onto B4389. 1 mile up hill to minor crossroads near top. Turn left. go 0.4 mile - fork right, then 0.4 mile - turn right, 0.5 mile - white house on left. We have three wheelchair accessible bungalows with covered porches: Car parking directly outside to 1:12 ramp access with handrails. All internal doors are 29” (840mm) and the windows are lowered so that our guests can see out. No steps, all level, and all have smooth carpets. Sockets and rocker light switches are approx. 33” (985mm) above floor level. Oven controls are on front just below hob level. There are no meters for gas or electricity. We have bed-guards and bed-blocks available for some of the beds, a wheeled shower chair/commode with removable arms, folding wheelchair and wheeled walker and a freestanding toilet frame, plus chair-blocks and a ‘percher chair available for guests to use. We have a small hoist available (20 stones max weight) (a donation towards servicing would be much appreciated.). We have a Radar Blue Badge Toilets Key available on request. Games room is accessible, 26” (762mm) door, pool, table tennis and darts. A ‘wheelchair accessible places to visit brochure recommended and compiled by our guests is available for use during your stay. Swallow cottage – 3 bedroomed cottage This was built in 2006 to our specification, very roomy. External door is 3 (915mm) Oil-fired central heating is in all rooms. The kitchen and living room are very spacious. Double bedroom (bed height 25” 620mm) and 2 twin bedded rooms (bed height 24” 610mm) are wheelchair friendly. One of the twin rooms can be converted into a ‘superking bedroom, please advise when booking if you would like this. Shower room is wheelchair-friendly, toilet (height 18¼”465mm) and roll-in shower both have horizontal grab rails, 60 degree angle rails and fold down rails. The wash hand basin has access underneath for wheelchair. There is a pull alarm cord next to the toilet and a separate toilet for non-wheelchair users. Lots of equipment for disabled guests, access statement available on request. Hoist - £20.00 per week. This is payable on arrival and is towards servicing costs.